After the U.S. Election, What's Next for Science? Wednesday, November 9, dawned gray and raw in Berlin. I was there to moderate a couple of panels at an annual meeting called Falling Walls. The name and timing celebrate the anniversary of the Berlin Wall's fall, as well as the free exchange of ideas if only we can knock down barriers. I looked forward to a series of inspiring talks about how science, which I have often called the “engine of human prosperity,” could help us solve some of our greatest challenges. We all crowded into a large room at the start of the day. A live broadcast began, looming above us on an enormous screen. The Falling Walls attendees watched the acceptance speech of the U.S. president-elect, Donald Trump, whose campaign included a promise to build a new wall. What would this mean for science, I wondered? As a candidate, Trump had made some troubling antiscience statements, including tweeting that global climate change is a Chinese plot, threatening that he would dismantle the agency that enforces clean air and water regulations, and endorsing the long-disproved link between vaccines and autism. Any hope that he would soften those stances after victory were quickly dashed. His first actions as president-elect included putting forward a climate change skeptic to head the Environmental Protection Agency and reportedly looking to make good on his earlier intent to pull out of the Paris climate accord. For 171 years, Scientific American has chronicled the advances of science (and even fostered its application, with its patenting offices, starting in 1850). While at Falling Walls, I reflected on how many voters had come to feel disenfranchised in the face of that progress, leaving them with a sense of reduced opportunity. I thought about how we who work in and around science could be more inclusive in our outreach to them and to policy leaders and how we could help take a systems approach to better ensure that research will be applied in ways that result in greater public benefit. I thought about how we could still work together to build a better world. We just might have to try a little harder to get there. For these reasons, we are expanding the scope of our reporting on public policies that will affect science to round out our traditional coverage of the impact of that research on human lives. 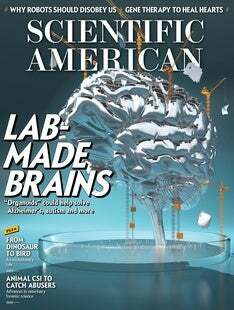 One thing is as clear today as it was when this magazine was founded in 1845, during the flowering of the industrial revolution in the U.S.: a world in search of solutions to humanity's challenges needs information about science, and Scientific American will be tireless in providing it.